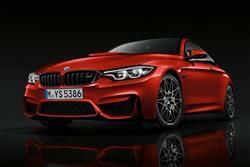 Find out everything you need to know on the new BMW M4 from independent vehicle review website Car And Driving. You can watch the video review to the left to see more of the car or read their written review below to get a true insight from an expert in the automotive industry. BMW's M4 coupe has been subtly improved. And it's as potent as ever. Jonathan Crouch reports. The BMW M4 promises to be everything you might hope for. Fast, smart, good looking, reasonably cost-effective and well-equipped. With a manual gearbox if you want it too. And the option of an extra 'Competition Package' that further enhances driving dynamics. Can a turbocharged six-cylinder engine ever offer the charisma of a screaming V8? Probably not but that seems to be the only sacrifice you'll need to make. Here, we look at the lightly revised version. The BMW M4 isn't a name that comes easily to a generation raised on BMW's iconic sports coupe being called an M3. We had four generations of M3, starting with the four-cylinder E30, graduating to the six-cylinder E36 and E46 models and finishing with the V8 E92 version. At its launch in Autumn 2014, the M4 wound the clock back, offering a six-cylinder engine plumbed under its sleek bonnet, though this time it sported an addition never seen on this family of M cars; a pair of turbochargers. Thus equipped, this car offered less weight, more power and better efficiency than the screaming V8 fitted to its direct M3 Coupe predecessor. More recently, an optional 'Competition Package' has been made available to slightly increase power and improve drive dynamics too. Plus in the Spring of 2017, subtle changes were made to the front end. Is the charisma there though? That was certainly an issue with recent M5 and M6 models. Yes, they were on paper better than their forebears but those predecessors undeniably felt more special. Like it or not though, efficiency is the new measure by which manufacturers compare each other, even when building super sports cars, but BMW points out more than a few reasons why the M4 still has a certain X-factor. As before, M4 buyers have two options. Either to go for the standard 431bhp model. Or to choose this car with the 'Competition Package' option, which increases power to 450bhp. In both cases, you get the same twin turbo 3.0-litre straight-six that does its best work from just 1,800rpm, offering a huge advantage in real world driveability thanks to the massive 550Nm torque figure - an increase in torque of 40% over the old M3 Coupe model. There's a choice of a manual gearshift (thank goodness) or a dual-clutch paddleshift auto transmission; with the latter installed, the sprint to 62mph takes just 4.1 seconds - or 4.0 seconds with the 'Competition Package' model. The engine is helped by a launch control mode and there's even a 'Smoky Burnout' setting you can switch to if you really want to get breathalysed. There's also an Active M Differential to help improve traction and an M Dynamic Mode in the stability control software, which allows owners a degree of slip angle without turning the safety net off completely. The steering is an electromechanical set-up featuring three modes: Comfort, Sport and Sport+. The 'Competition Package' includes Adaptive M Suspension, extensively tuned to the enhanced performance and handling. It features new springs, dampers and anti-roll bars, along with a reconfiguration for the driving modes. The standard Active M Differential on the rear axle and DSC Dynamic Stability Control are likewise configured to match the upgraded dynamics. The M4 hasn't changed much. It gets the slightly sleeker front end recently added to more ordinary 4 Series Coupe models and all M4s now get LED headlight and LED rear lamp clusters. Otherwise, from the outside, things are much as before. Which means that the classic wide-arches, long bonnet, long wheelbase and short front overhang are all present and correct, as is an integrated carbon fibre tail spoiler. You also get M side gills with Air Breathers, this an aero feature that combines with Aero Curtains in the front apron to help optimise the airflow around the wheel arches and therefore improve aerodynamics. The proportioning looks really good, BMW doing some smart work at both front and rear to visually lower and widen the look of the M4. Carbon fibre for the roof, drive shaft and engine strut brace combines with the aluminium used in the front wings, the bonnet and various suspension parts to help keep weight down to 1,495kg; that's around 80kg lighter than the previous M3 coupe. Inside, recent changes include illuminated M4 emblem on the front seats, double-stitching on the instrument panel and extra chrome and electroplated detailing. As before, the M4's front seats take inspiration from the bucket seats fitted in racing cars and feature a full-size single-piece back panel. There's electric adjustment and heating as standard while the upholstery is segmented and has some lovely stitching and perforation details. The rear seats are built from a lightweight composite material and can be folded in a 60:40 split for added practicality. With the 'Competition Package', you get exclusive forged, machine-polished 20-inch M alloy wheels with exclusive multi-spoke M styling plus special lightweight M sports seats. Pricing sees the standard M4 coupe costing around £58,500, while there's a Cabriolet version priced at around £62,500. In either case, there's the option to add the 'Competition Package' for an extra premium of around £2,600. So what does that budget buy you? Well, whichever version you choose, you'll find an interior that's successful in blending traditional M car sportiness with genuine refinement. There are a host of traditional BMW M equipment details, including M door sill finishers, an M gearshift lever, M design circular instruments with white graphics, an M leather steering wheel (with M logo, chrome trim and iconic triple-colour contrast stitching) and metallic shift paddles (if the M DCT gearbox is specified). The BMW Individual headlining is finished in Anthracite. Standard kit includes adaptive M suspension, 19-inch M light alloy wheels, front and rear park distance control, exterior-folding mirrors, 'Shadowline' exterior trim, plus a full BMW Professional Media package with upgraded Bluetooth system. Options include BMW Individual paint finishes, Merino leather and interior trim elements. A bit of fun is the free BMW M Laptimer app, which allows owners to analyse their personal driving style. Once their smartphone is hooked up to the car - via USB cable or the car's snap-in adapter - drivers can operate the BMW M Laptimer app using the iDrive Touch Controller. The app then records speed, longitudinal and lateral acceleration, engine revs, the gear engaged, steering angle, accelerator position and fuel consumption. The data can subsequently be analysed via graphic displays on a smartphone, including driver reaction times. Those who try to compare the M4's performance stats unflatteringly with those of the Nissan GT-R need to look at the flipside of the argument. For a moment, we'll ignore the fact that the Nissan is more than £20,000 more expensive, making a Mercedes-AMG A45 a closer match on price than the big GT-R. Let's look at efficiency measures. On a good day, you'll see 24mpg from the Japanese car, emitting 275g/km in the process. By comparison, an M4 with a similar twin-clutch transmission will see 34mpg and 194g/km. Let's try to compare eggs with eggs a little more accurately. Mercedes C63 AMG? That gets 32.8mpg and 200g/km. How about the Audi RS5? Not even close. That manages 26.9mpg and 246g/km. BMW has once again demonstrated that its engineering is superior. You know it's something special when it's £19,000 cheaper than a Porsche 911, outperforms it, gets better economy and emissions, offers more space inside and delivers more in the way of equipment. Residual values should hold up well too. This isn't a tired old platform that's being rolled out for one last hurrah. Used demand for the M4 should be extremely strong. To the uninitiated, the M4 might not seem a very adventurous update of the formula of the old M3 coupe. It's approach in swapping out that car's screaming V8 for a more efficient inline six backed up by a couple of turbos for better efficiency might appear an exercise in playing it safe. Closer examination of the details reveals that's far from the case. Yes, BMW and everybody else have to make changes in order to lower emissions and improve economy and if that means sacrificing a measure of extremity from their engines then so be it. We'll swap that for 40% more torque and a chassis that makes the old car's seem positively antediluvian. Here is a model that's been the recipient of some wholly considered product development - a well-judged blend of focused performance design and luxury refinements. Which is why this M4 has carried on where the M3 coupe left off and continues to thrill a new generation of buyers.